Societal values and personal appearance play a massive role in deciding to quit smoking. With the majority of quitters admitting that what others thought of them smoking, was a residing factor in their decision to quit. This links heavily into individual appearance as cigarette smoking has the ability to alter ones external features from yellowing fingers to causing permanent skin damage. This is the basis for Queensland Government’s ‘If you smoke, your future’s not pretty campaign’ which aims to curb smoking addictions within the female population. 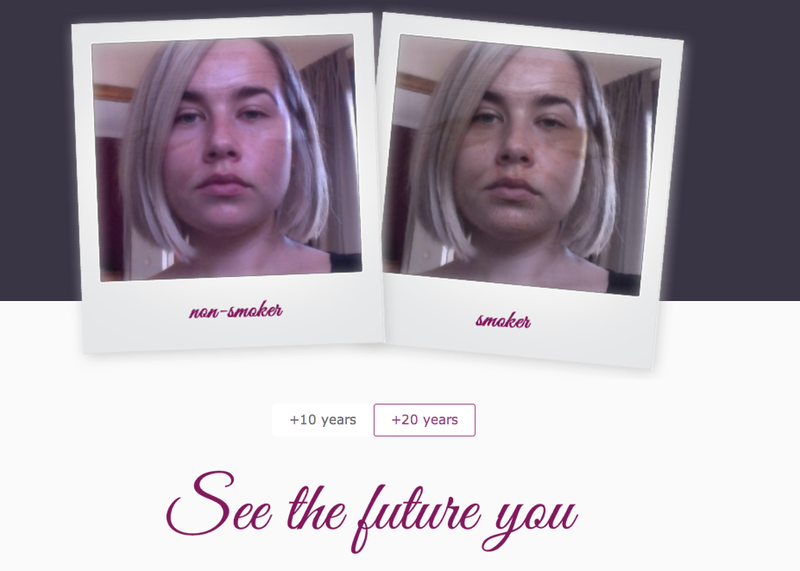 By appealing to inward vanity the campaign encourages individuals to upload a photo to the Future You Smoking Booth and see how your appearances ages when smoking. Our Chooseday writer, Lucy road-tested this fun app and found the results scary, see below. What we love about this initiative is that plays on the vulnerabilities of a smoker by talking about the future effects smoking will have on your appearance. More importantly, the campaign works towards seeing a reduction in female smoking in Queensland, where one in five women smoke whilst pregnant. Queensland readers make sure you check out the ‘If you smoke, your future’s is not pretty’ roadshow. Thanks for sharing, will make sure we post on our Facebook for our choosedayer’s! In some places I know, it is unfortunately the opposite. Some non-smokers have actually picked up the hazardous habit due to peer pressure and desire to ‘fit in’. It’s only one example, but I’ll just share what I’ve heard from my friends from Singapore’s military service (where it’s mandatory for all SG men), smoking has become commonplace and if you don’t join in, you’re very likely to be outcasted – which is quite a horrible thing considering you spend almost 2 years with the same exact group of soldiers every single day. Also in South Korea, where in some regions smoking is considered as the thing-to-do in junior-high and high schools that if you aren’t one of them, you’re likely to be a huge target for bullying. I’m sure there’re other places where it’s similar. Wow what interesting insights. I never thought about how other micro communities are effected by the social smoking, great examples @rapha24mt!